CORE TECHNOLOGY - CND PROCESS MEDIA Unique combination of PP cotton, carbon fiber and nano deoxidization material creates an electro-chemical reaction. During this reaction, free chlorine is changed into benign, water-soluble chloride, which is then carried harmlessly through the water supply. Similarly, some harmful heavy metals such as copper, lead, mercury and others, react to plate out onto the medium's surface, thus being effectively removed from the water supply. With most of micron holes, which help to filter sand, rust, suspend solids and some parts of protozoans. Its performance is six times than the normal activated carbon, reduces pesticide residue, organic matter, unpleasant taste and odors. Compared with simple materials piling up, our integral forming treatment upgrades the performance of filtration media greatly, increases the lifetime and absorption area by 6 times than before. Meanwhile, it helps to avoid the water leakage. Intelligent indication display can remind you when to replace the filter cartridge. In order to keep it comfortable and effective, when its ending signal shows red, please replace the whole one. Effective without reducing water flow and works with cold and hot water. Speedy flow rate of 2.0 GPM and a filtering capacity of up to 8,000 gallons! Keep the large water flow while maintain excellent filtration performance. Let you enjoy the best showering experience. 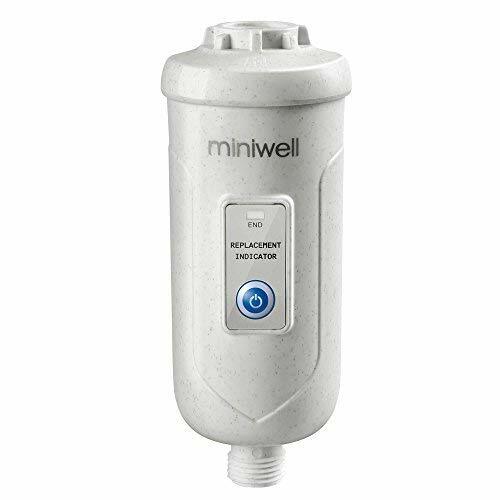 PRODUCT ADVANTAGES Miniwell Shower Filter provides you revolutionary natural showering experience. High Effectively Remove 99% Chlorine, DBP(Such as THMs), pesticide residue, unpleasant taste and odors. Please see the testing result on left side. After filtration by L730, the sand dirty water turn clear immediately. You can do the testing by yourselves. Test Strip A is washed by the filtered water,which not appear any chlorine, while Strip B is washed by tap water, with 0.3 ppm of chloine. Can be used with any overhead Shower Head, Handheld Shower or Shower Combo. ★ Notices This system is a disposable product, please replace the whole unit when it is end of life. Do not use with water that is microbiologically unsafe or of unknown water quality without adequate disinfection before or after the system. This system is not for use as a drinking water treatment unit.